Chocolate Bunny Ribbon, 5/8 inch, increments of 5 yards or 27-yard roll. welcome to Over the Moon Ribbons! Welcome! We hope your experience shopping on our site will be a happy one. We pride ourselves in our customer service so whether you have technical issues or questions about product, email us at ribbonlady70@gmail.com or call us at 1-717-568-8230 and we will be more than happy to help you. 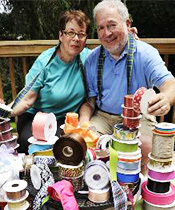 We are constantly adding new ribbons as a result of your suggestions so check back often. Make your Christmas tree beautiful with ribbon.